In Margate, junk removal is an essential service for those considering renovations, new construction, seasonal cleanouts, or a property foreclosure. XS Trash is licensed, bonded, and insured to remove debris, trash, and unwanted bulk items from your property, with affordable rates and same-day service. We are fully equipped to handle any kind of debris or trash you have piled up around your property and won't ask you to relocate any of the mess before we arrive. 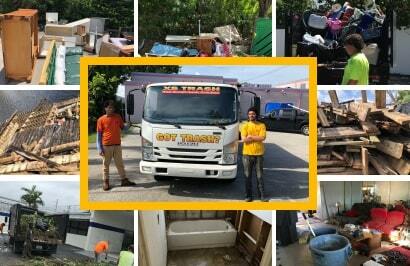 Simply point toward toward mess and our Margate junk removal team can take it from there, always aiming for 100% customer satisfaction. Include our licensed in-house Bobcat operators with your service for Margate junk removal for a faster, more efficient experience. Our uniformed workers will not interrupt your daily operations, instead choosing our time wisely to maintain a spotless and safe environment for your team to focus on the task at hand. Whether you have a single bulk item or an entire truckload of debris, XS Trash can fit more into each load with our 21-yard-long service trucks, reducing the number of journeys we have to take during your Margate junk removal and saving you time and money. Dump fees, transfers, labor, recycling, and added weight are all included in your FREE estimate, so call today to get started. Licensed & Insured Margate Junk Removal, Junk Pickup & Hauling.